Designed to prolong the life of your turbocharge, while adding connivance. 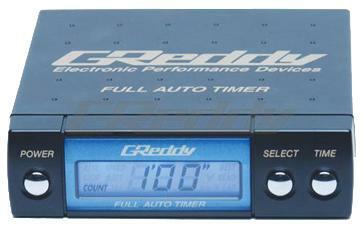 GReddy Full Auto Turbo Timers allow a vehicle to idle the engine for a timed period, with the ignition key removed. This conveniently allows the engine oil and turbo center cartridge to cool down properly and prolong turbo and oil life. This can be done by two standard programmable count down presets (P-1, P-2), or the GReddy Full Auto Timer can use it’s two auto timer modes (A-L, A-H). The modes estimate the driving RPM according to the vehicle’s alternator signal and then recommend a count down time. A stopwatch/lap time and attack modes along with a built in voltmeter and speedometer are also standard features. Safety options for the parking brake and speedo hook-ups can be used to disengage operation if vehicle is attempted to be moved without the key. There are also optional easy to install plug-in adapter harnesses available for most Japanese turbo vehicles.